I just spent an amazing, life-changing two weeks in Spain and France. I spent three days Madrid, a weekend outside of Montpellier in southern France, five days in Barcelona and a weekend in San Sebastian. The food was different in every location and it is impossible to decide which was my favorite. Everything was just that good. I ate my way through every town we visited and I am now paying the price. I made the decision to eat vegetarian for this first week back in order to get my diet and body back on track. I don’t usually consume dairy- cheese is really the only thing I eat on a somewhat regular basis- or meat – rarely more than two or 3 times a week. I’m pretty sure my typical diet would survive living in Spain… cafe con leche at least twice a day, frequent visits to a museo de jamon, pintxos in San Sebastian with thick slices of goat cheese, etc., etc., etc. 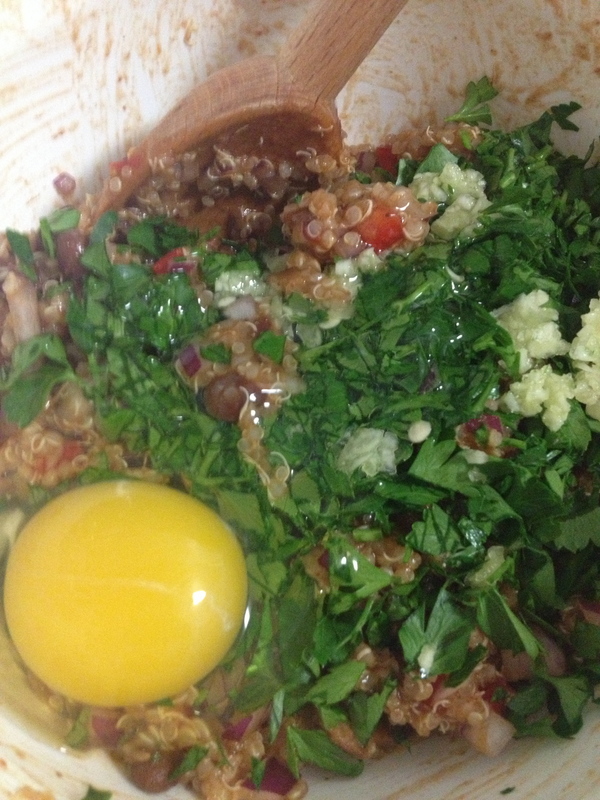 *I used vegetarian chili because, in my fog of jet lag, I bought chili instead of normal black beans. Don’t do this- it made the patties wetter than necessary and they didn’t hold their form that well! I have been enjoying my kale and pineapple smoothie for most breakfasts recently but today I wanted something different. Instead of waking up to my room flooded with sunlight (yay for east-facing windows), I woke up to the sound of rain falling and I, like most people, love to indulge in comfort food when the weather is less than stellar. All I wanted was a big, fluffy pancake. 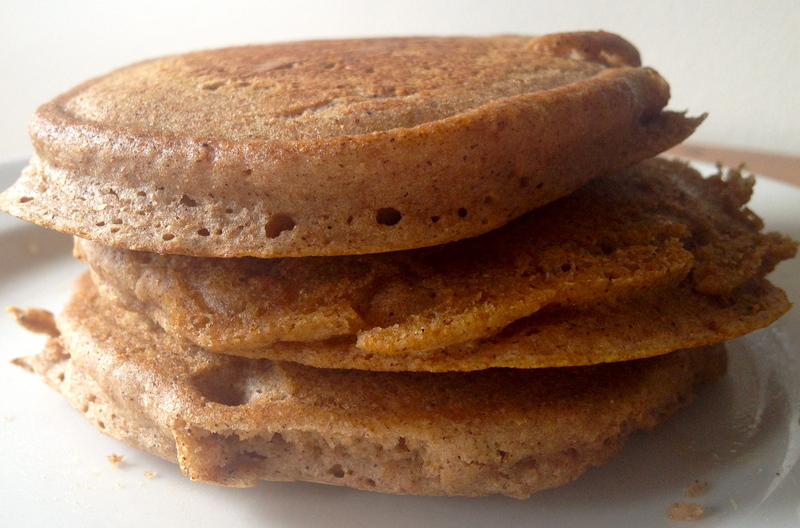 I have made healthier versions of pancakes before but I have never been able to get the points value low enough to really justify removing most, if not all, of the fat. Today I set out to make a 2 point pancake! I made a few key changes to get the points value down while trying not sacrifice the flavor or fluffiness. First, I cut out the milk. I think I have mentioned that I try to keep an eye on the amount of dairy I consume so I don’t even keep it in the fridge. Instead, I had almond milk on hand so I gave it a try. Baking is science and fluffiness depends purely on the amount of carbon dioxide that is released in the batter. This is why buttermilk is popular in pancakes. Not only does it give the pancakes a great flavor, it has a higher acid content than regular milk (and definitely almond milk) so it has the ability to release more carbon dioxide. Second, in order to make up for the absence of an acidic liquid in the batter, I used baking powder instead of baking soda, which is also a popular ingredient in fluffy pancakes. 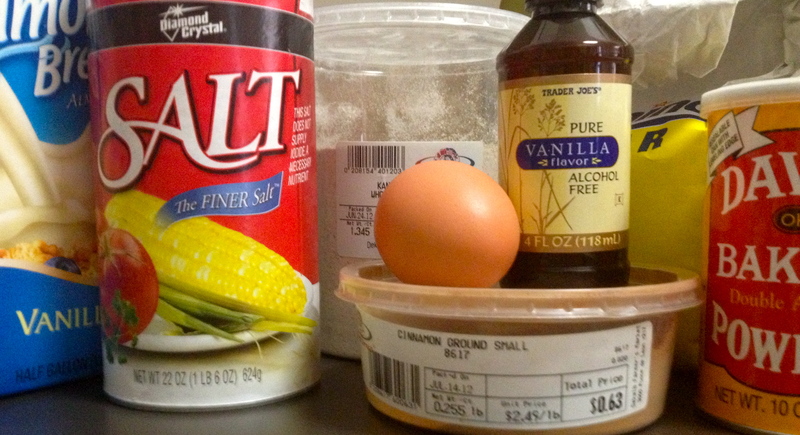 I did this because baking powder has a higher acid content than baking soda. Lastly, I added seltzer water to amp up the carbon dioxide even more (and cut out some more calories/points). 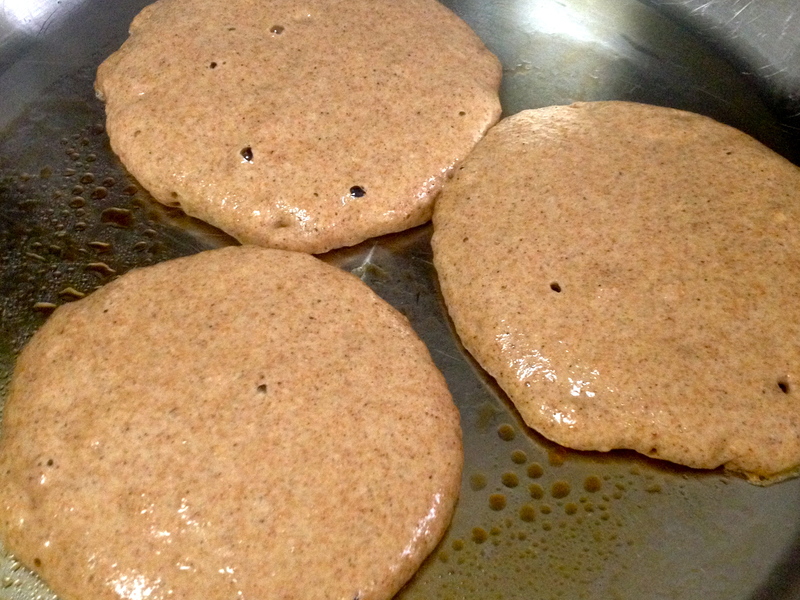 You have to be careful with all this though- you don’t want to mess with this too much because too much acid will increase the gluten development and create a tough and chewier pancake. In order to get the fluffiness without the chewiness, I refrigerated the batter for about 15 minutes (you can leave it up to over night if you want to) to slow the gluten development before cooking. The pancakes turned out better than I could have imagined! 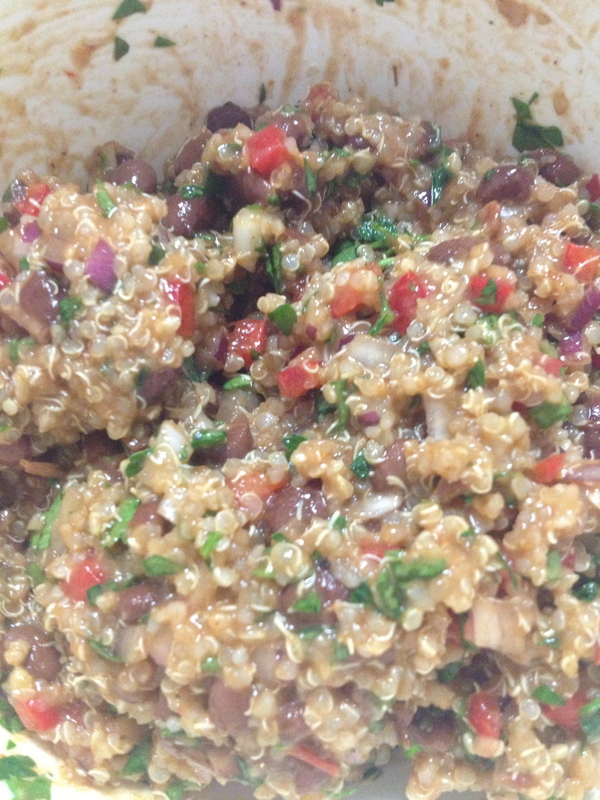 I will probably continue to tweak this recipe until it’s absolutely perfect but, for now, it’s amazingly delicious. The best part? You could eat this ENTIRE batch and it’s only 14 points! I went with 3 pancakes and a tbsp of maple syrup for a decadent 7 point breakfast! When the bubbles settle and the edges begin to set, flip the pancakes. 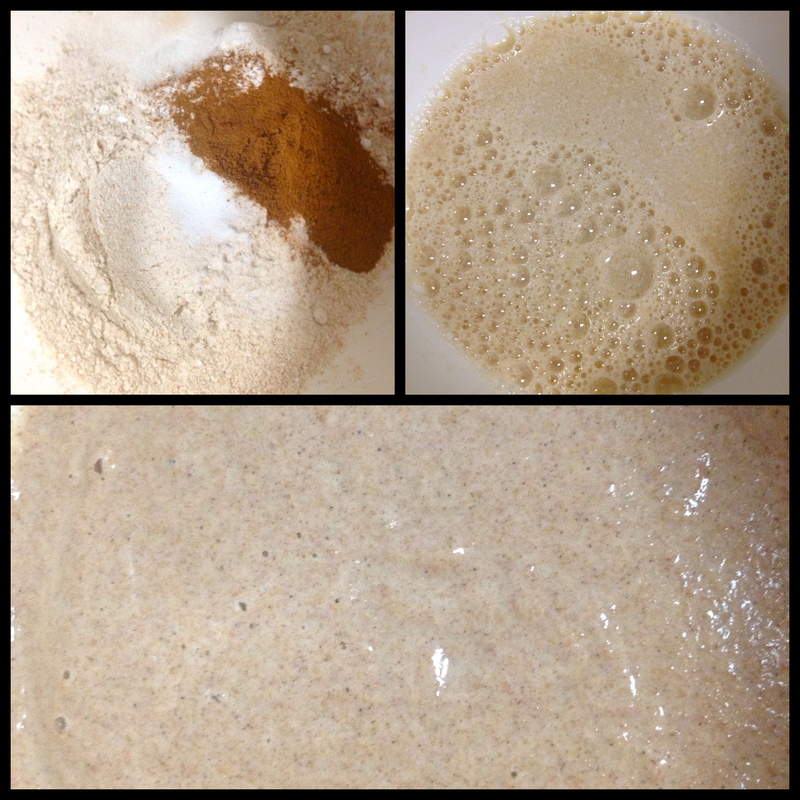 Repeat with the remainder of the batter. My picnic was a success (well still is because I am still sitting here in the sun)! 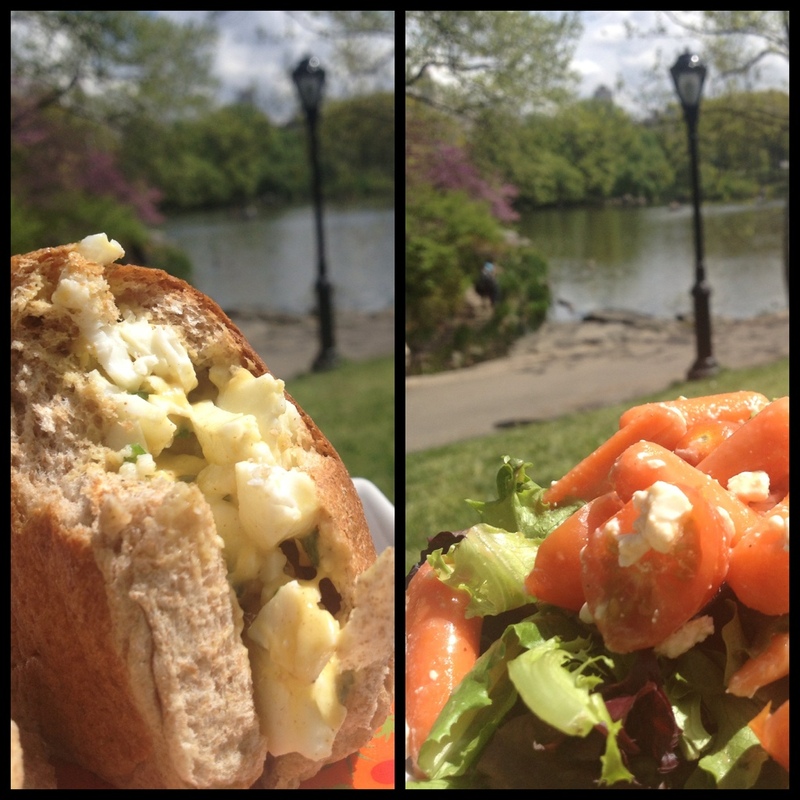 The egg salad is delicious and the salad in a mason jar kept my dressing away from greens on the trip down to the park! I packed a seltzer water, small plate and fork into my left over Organic Avenue insulated bag along with the egg salad (securely in a tupperware), toasted rolls, and my mason jar. All I had to do was toss in an ice pack and I was on my way. It’s just too beautiful to be inside! It is a beautiful day in New York so I decided I wanted to make a picnic and hang out in Central Park. I have never done this in the 3 years I’ve lived in New York and I’m not sure why I haven’t! This week has turned into a week where all my meals are coming from previously frozen soup, extra eggs and canned beans so I needed to get creative when putting together my Central Park lunch. I had a few things on hand (extra eggs from making the Ina Garten brownies, rolls in the freezer from making burgers over the weekend, garlic chives from the Goi Cuon and the fixings for a salad in a mason jar) so I decided to throw together a WW-friendly egg salad- I know, not the best thing for a picnic in the sun but whatever! Discard yolks from two of the eggs. Chop remaining whole eggs and whites into bite-size pieces. 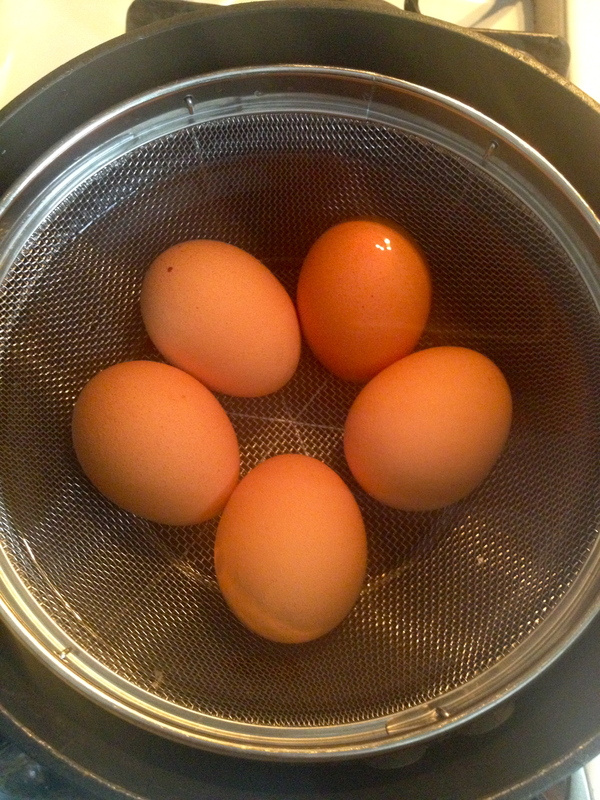 Transfer eggs to a medium bowl. 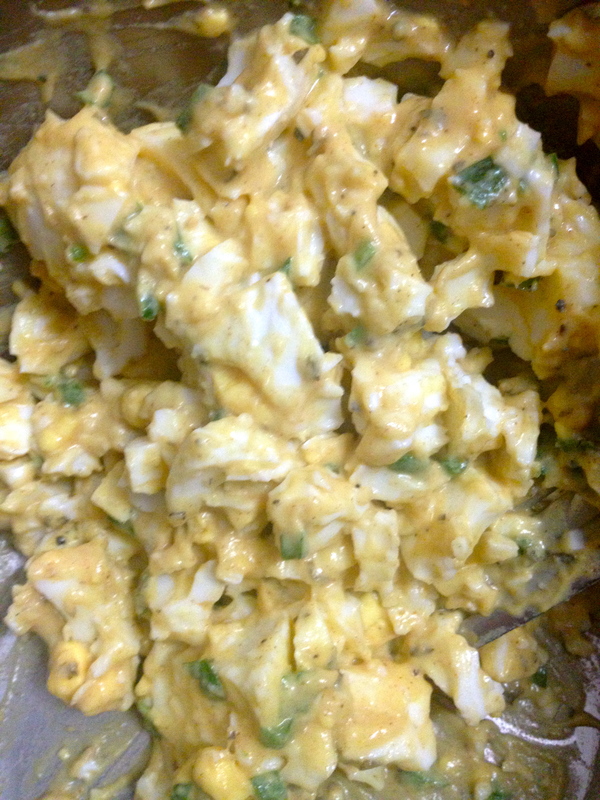 Add chives, mayonnaise, mustard, salt and pepper; mix until blended. Whenever people ask me how I ended up in New York after college, I have to go back to my semester in Vietnam. I was a History major and concentrated on Cold War American society (specifically how the Vietnam War affected American society) and this is how I found myself headed to Vietnam in August 2008. Little did I know my “career path” would change after my 5 months there. There is something about Vietnamese food culture that captivated me from the moment I landed. Eating a meal is about sitting with friends and neighbors and sharing what you have created from simple ingredients that were cultivated from your family land- land that has been yours for generations. I will always remember being in Nha Trang (South/Central Vietnam) and out on a boat with the entire CIEE group (which was only 19 of us). We had been on the boat all day when we were lead to the roof where a feast of fresh seafood had been prepared for us. It was the moment I decided I wanted to get into the food industry and be as close to good, simple, local food as possible. This morning Nick sent me an article from the New York Times about a man’s relationship with food in Vietnam. Reading it, I was brought back to my own journey with Vietnamese cuisine . I will always remember my first morning there. I stumbled out of our hotel in the backpackers district in Saigon and I had no idea how to find something to eat. I wasn’t nearly as adventurous with food as I am now and I was all by myself, in a city I did not know, surrounded by a language I could not understand. I walked down our block and stumbled upon a bahn mi cart (I did not know this is what it was at the time). I pointed at something that looked remotely breakfast-like- little did I know that the pho restaurant right behind it would have been the right choice for a true Vietnamese breakfast. What I pointed at was something like a dumpling so I just bit into it. I had no idea what was inside, so I wrapped it up and brought it back to the hotel to find one of our directors so he could tell me what it was. Inside my “breakfast dumpling” was a soft boiled quail egg. I couldn’t finish it knowing what it was. Looking back, I’m sad I couldn’t appreciate how special that first meal was and how delicious it could have been. I ended up throwing it away and waiting until lunch to eat again but I wish I had just enjoyed experiencing something different. My daily routine did turn into going to a “people’s food” store front twice a day that was located just across the street from our hotel. I would go first thing in the morning for a bahn mi with a fried egg on top and again for lunch for a bbq pork chop with sauteed greens with garlic and rice (exactly what the author describes in the article above). 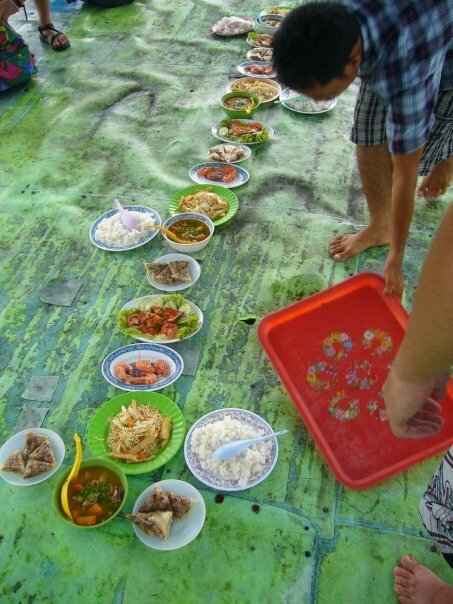 I miss those days of being in the warm sunshine, eating a simple meal that cost less than 75 cents. I cannot wait to go back to Vietnam (hopefully soon) and experience the food all over again but, this time, with a much better appreciation for just how special Vietnamese food culture really is. For Easter I wanted to try out a few new recipes. 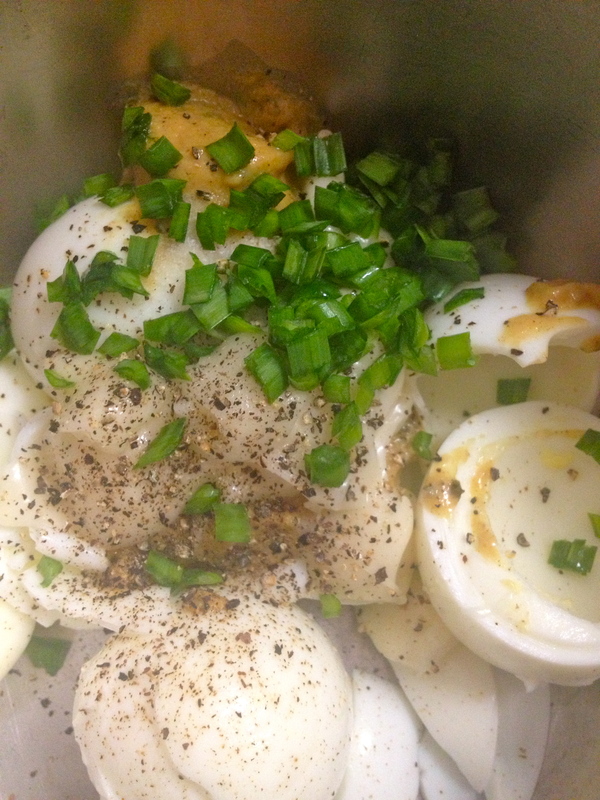 I love everything Ina Garten so when I stumbled upon this deviled eggs, I had to try it- I mean whats not to love? Eggs and smoked salmon! The challenges I always face are budget/food cost, keeping with in my Weight Watchers points and making sure the recipe is easy enough that I will be willing to make it over and over again. Although this recipe isn’t the healthiest, I switched out the heavier ingredients with reduced fat or low-fat options and they still tasted great! The egg yolks add so much flavor and creaminess that you don’t miss the full fat flavors of the sour cream, cream cheese and mayo. I also modified this recipe by leaving off the salmon roe. The roe would add a great burst of flavor but at $18.99 for about 2 oz. it’s just a tad expensive to use as a garnish. I also saved some money by buying a small plant of chives ($1.99) instead of buying the pre-cut chives for $2.49 that would just go bad in a few days anyways. Now I have chives that will keep growing back! I’ve also recently started following Smitten Kitchen after noticing both my roommate and another friend had the cookbook. I honestly don’t know what took me so long to pay attention to this amazing blog! There are so many great recipes and the are so easy! I stumbled upon this one the other day and figured it looked delicious and too easy to mess up. I had most of the ingredients in my kitchen so all I had to buy was the broccoli and parmesan. 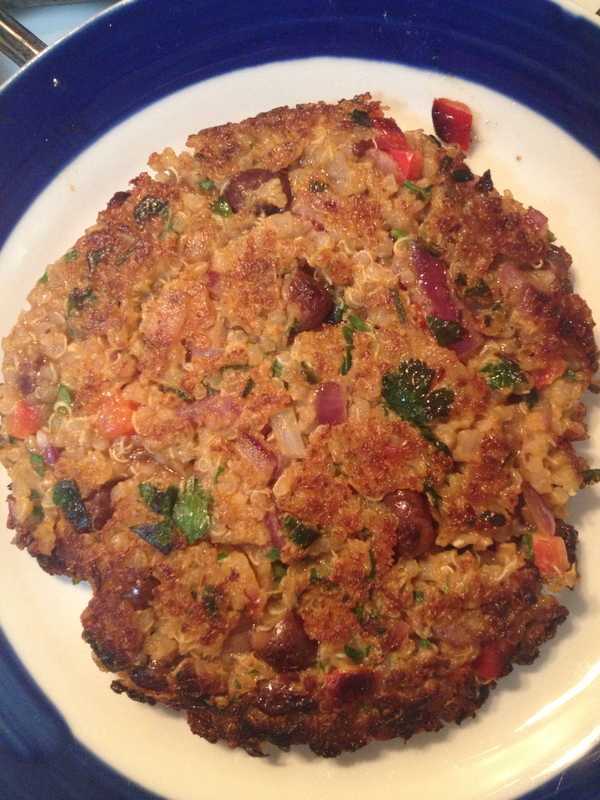 I followed the recipe pretty closely but I think I will change it up the next time I try it. 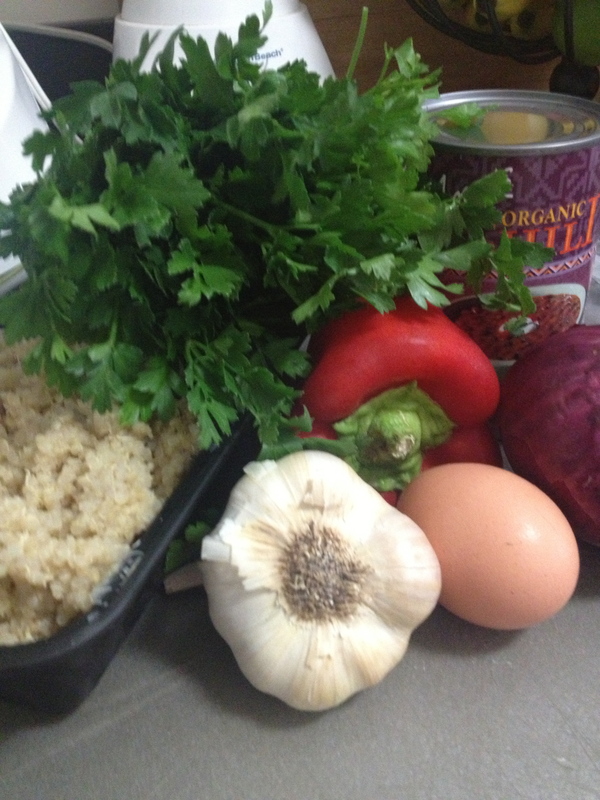 Although buying local and seasonal is always my first choice, it’s not always the most convenient or cheapest. Next time I plan on using Trader Joe’s Broccoli florets that microwave in the bag. It is the perfect amount of broccoli, it is cut to the right size and using the microwave makes it so much easier! I also think I might try spraying them with my Pam Olive Oil spray and putting them under the broiler to lower the amount of oil used. Heat a large, heavy skillet over moderate heat. Once hot, add a good slick of oil (I usually use a mix of olive and vegetable oil), about 2 to 3 tablespoons. Once the oil is hot (you can test it by flicking a droplet of water into it; it should hiss and sputter), scoop a two tablespoon-size mound of the batter and drop it into the pan, then flatten it slightly with your spoon or spatula. Repeat with additional batter, leaving a couple of inches between each. Once brown underneath, about 2 to 3 minutes, flip each fritter and cook on the other side until equally golden, about another 1 to 2 minutes. I also made this yogurt sauce to serve with the Fritters as a last minute addition to our Easter menu. All I had to so was buy a lemon because I had everything else on hand. To lower the fat and make it a little more WW friendly, I used low-fat Fage Greek Yogurt as the base. I also used some garlic power to up the garlicy flavor. Combine all ingredients, cover and chill in the refrigerator for 30 minutes so the flavors can marry.